Data profiles, types and mechanical translation for small Internet-of-Things devices. It is a useful abstraction to separate the place and thing that is being measured (eg like a "meter point") from the sensor cluster that happens to be doing the measuring. For example so that data can take various routes manually and automatically, and to allow equipment replacements and upgrades in the field. In the comms model as of 2014/05/29 such abstraction happens downstream of the concentrator/redistributor and might be done by logically associating a combination of (sensor and) leaf node ID, concentrator ID and time-window with a particular "meter point" or equivalent. Redeployment or replacement of a sensor/node should create a new association, and forcing the sensor/node to change its ID (eg to a new random one) may help with this so ensuring that a "meter point" maps to one or more sensor/node IDs but usually one sensor/node ID (with all its readings) is unique to one meter point. See the notes in 2015/05/29 Data Sets and Processing meeting notes for an illustrative cursory cut of the sorts of inputs (sensor and other data set) and outputs (metrics/KPIs) for a building health use case. Note that for the mobile sensors, eg parked on people, a chat with Paul Tanner (2015/05/29) suggest that some variant on the BuggyAir technology with data backhaul through staff phones or WiFi or Bluetooth Smart (and/or providing location as beacons) might be suitable, and that measures NO2, CO2, PM2.5. 1. Check that the frame can be parsed, if not return an error (HTTP ???). also depend on how the sensors have been commissioned. 3. If existing sensor, check that frame number received = last frame + 1. 4. If unit is specified check that it matches the unit known for the sensor. If unit mismatch, send back hard error code. frames, specifying last received frame + last received time stamp. error asking for unit to be sent in next frame. Note that we need to have a unit value for unit-less numbers. should also be compatible with it. 1. If all OK, stop processing. 2. If missing frame code, send missing frames in one or multiple messages. To be done in D38. "...research indicates that the requirements for sensors are not universal and that depending on the indoor environment, e.g. what it’s used for or where it’s located, different sensor sets are required. As such, it may be an important aspect of our research to look at differing requirements in different room types, not just assume that one-size fits all." "retailers can measure benefit directly through increased sales"
"for outdoor monitoring when relating to office space, ... it’s the comparison between indoor and outdoor environment quality, particularly air quality, which is of particular interest"
Interoperability and discoverability are important for large IoT deployments, where there is no time to hand-craft solutions for integrating sensor data sources. Bruno's (EnergyDeck CTO) D15 note 2015/065/16: SenML and HyperCat. attributes to avoid having them repeated in individual data point entries. units such as C16 that should be transformed into a standard unit. Note on my notes: I didn't convert the "h" unit as I can't remember what it is. values are always in the UTC time zone. the SenML data but are useful in the catalogue to enable filtering. all units in that metric. 2015/06/22: Bruno and Damon discussed the desirability of completely mechanical conversions from JSON sensor units to UCUM/SenML units to minimise or eliminate magic 'mappings' that require sophisticated developer time (in line with IBM suggestions). One particular issue that cam eup is being able to represent value as integers (for brevity and to keep code small on the sensors) and scale to integers for transit, when the natural scaling is a power of two, eg temperatures from common sensors with four significant bits after the binary point, ie that are currently being sent with units |C16 for "Celsius times 16". Bruno was going to investigate. One possible escape hatch is with the Ki/Mi/Gi/Ti "special prefix symbols for powers of 2". 2015/06/27: Note: mechanical translatability from any binary formats used (such as OpenThings, TinyHAN profiles or application-specific hand-crafted) is highly desirable for the same reasons, eg so that the concentrator/redistributor can convert them mechanically for downstream fan-out and make the data discoverable. That may imply a plug-in at the concentrator per upstream (binary) format to convert to a common presentation and processing format such as JSON and/or SenML. Bruno's (EnergyDeck CTO) D15 note 2015/06/19: config file format. The list of options is then specific to a particular handler type. - Is it sensible to have a fully qualified Java class name as the type? that takes a configuration object. to simplify the handler definitions. DHD note: it should eventually also be possible to inline credentials in the config optionally rather than have them out of line as now. In part that should make remote management more sane and simple. A primary goal of this work is building a sensor system that makes data available in real-time, though reasonable notions of 'real-time' here come with data delivery latency ranging from seconds to days. Generally high-priority data, and/or that needs to be acted on quickly to be maximally useful such as our footfall data to feed into journey planners and bus dispatch, should have lower latency and usually low datum size to enable that. This might be dispatched over-the-air over an RF (radio-frequency) connection for example, as telemetry. Typically data updates would be sent every few minutes, though extra/early transmission of time-sensitive data is possible. Lower-priority and/or bulk data could, for example, wait for something to physically pass or connect to it, eg a bus passing a bus shelter could use WiFi to get a quick large historical (eg over prior 24h) data dump from sensors, maybe to be disgorged at the bus depot or another suitably-instrumented stop. It is anticipated that this data will be largely handled and available in real-time, possibly delayed or blocked for financial or security/privacy reasons in a few cases, eg bus shelter attendance in the small hours. Keeping alive downstream connections to avoid set-up overheads, typically of several RTTs (Round-Trip Times), especially where secure handshakes are necessary. Paying for low-latency QoS connectivity, eg more like leased-line than default best-efforts Internet service. Real-time uses of data are potentially more forgiving of (eg) changes of sensor and format, eg downstream code can be adjusted hand-in-hand with sensor data changes, though log files should be in a form that as far as possible is either explicitly documented or at which a reasonable guess can be made. This makes textual (eg ASCII line-oriented *nix-like) values with names and (UCUM) units a good default, even for the likely-terse data direct from sensors. (Some conversion from binary formats to text may be necessary, but should if possible be mechanical with the original data preserved as close as possible to the original, maybe even including a hex dump of the original message bytes minus any cryptographic elements not intended to be long-lived or widely exposed (eg to attack) (see D16 Security). A reasonable default may be to insist on a (compact) SenML translation of any message not directly representable in compact ASCII text alongside a hex dump of the message data bytes, with that translation being optional if the inbound message is suitable readable printable single-line ASCII7. 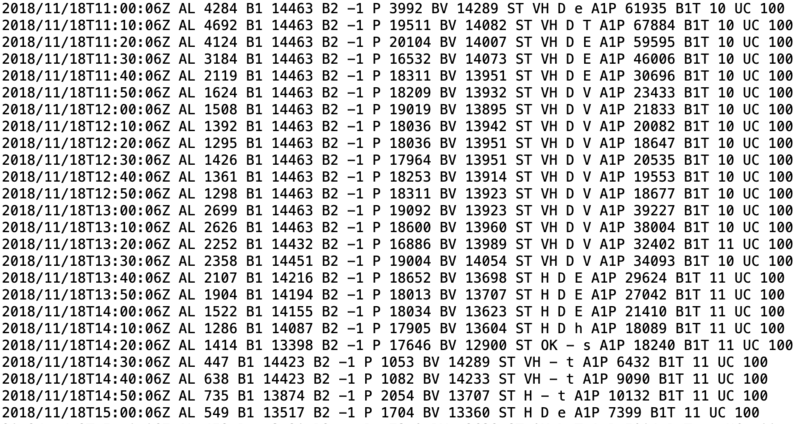 Note that if the receiving end of the RF link from the sensor provides a textual representation of what arrived over the wire, then that form may be treated as-if the transmitted form, eg as with @2D1A;T23C9;L16;O1 above. Note that these forms are intended to be written and accessed serially, and are not necessarily efficient for other than log writing and in reading other than for audit and bulk-data analysis. These forms will typically be less compact than a hand-crafted binary form, though standard common well-documented compression techniques likely to have decoders available for a long time (eg GZIP, LZMA) may eliminate much of that redundancy, while leaving the underlying form open to archaeology many years after storage. Current thinking (2015/06/28) is that as far as reasonably practical all the real-time (sensor) data (including metadata) should have a simple mechanical translation to SenML and be HyperCat-friendly for discoverability. Note that in general the expectation is that time stamps, and any data signing for long-term authentication (eg for non-repudiation and tamper-proofing), will happen at the concentrators (which can maintain accurate clocks and perform more elaborate cryptography). Concentrators will only sign incoming data that has passed link/source authentication checks, which should be sufficient authentication chain back from the hardware. Once out of real-time, we may take snapshots of real-time state across one or many sensors, or maintain and update live queryable time series thereof. Such blended uses between real-time and historical can be very useful, ie combining data right up to now with the historical set to make near-term predictions based on daily/weekly/annual/weather patterns, even if that latest data may not be stored in the same place as the older data. Databases such as kdb+ or software such as Chronicle, possibly more often seen in HFT/HST (High- Frequency/Speed Trading) in finance, may be especially suited to this task. Some sensor and post-analytics data, eg that put into open public data stores, will likely have some long-term value for many years after the termination of (say) this Launchpad project and other projects generating data using this framework. Thus we have to think about long-term archival at least of the data itself (physical archival media concerns are out of scope). Ideally data is 'self describing' but in practice something written in a simple (probably non-binary) format like the real-time log output above might be close. However, that is likely to conflict with being efficient in space and/or access-time terms. As for real-time data, where at all possible, data should be made easy to catalogue with and discover via HyperCat, and, if public/open data, actually be recorded in places such as Thingful. Digital Catapult Environmental Data Exchange (EDX). GLA (Greater London Authority) London Datastore. The earth.org.uk/opentrv.org.uk Web sites, plus SourceForge/GitHub. Real-time (streamed) and timeseries (historical) uses of the collected data should be supported. The availability of simple mechanical translations of all sensor node data forms to a common intermediate such as SenML with UCUM units (for appropriate sensors) is highly desirable for keeping development costs down (specialist developers that can target the distributor environment are costly) and helping with discoverability and long-term storage of IoT data. Fast processing will probably require loading that data (possibly with live updating from streamed inputs) into specialist binary or in-memory forms, but those will likely not be the archival/storage form. Metadata required for provisioning and on-going estate management should be generated by all sensor nodes intended for large deployments, including alerts for some physical tampering. A basic concentrator/distributor configuration format has been outlined, which should help facilitate remote management with something like TR-069. If existing open frameworks are able to cover what our existing proof-of-concept concentrator code has achieved then we may switch to one of them. Bruno's (EnergyDeck CTO) TR-069 review (also here). Bruno's OpenThings protocol review 2015/07/09 (also here). Bruno's D15 note 2015/06/19: config file format. Nic's (EnergyDeck COO) D15 note 2015/06/30: indoor and outdoor environment quality. Bruno's D15 note 2015/06/16: SenML and HyperCat. Bruno's D15 note 2015/06/07: Sensor Data Sets. 2015/05/29 Data Sets and Processing meeting notes. kdb+: "a high-performance column-store database with a built-in expressive query and programming language, q. Used as a central repository to store time-series data within an enterprise, kdb+ supports real-time analysis of billions of records and fast access to terabytes of historical data." Chronicle: "Inter-Process Communication (IPC) with sub-millisecond latency and able to store every message." Database Archiving for Long-term Data Retention. Long Term Data Archiving Formats, Storage, and Architecture. The UK Data Archive works with different data formats for different purposes. There are optimal data formats that are used for long-term preservation of data. Long Term Preservation of Digital Information. Digital Catapult Environmental Data Exchange (EDX) initial opentrv-raw-json-1 data set actually hosted at EOU. Thingful: "a search engine for the Internet of Things." Technical details of Current Cost RF protocol and Technical details of the EDF EcoManager and accessories. WorldGBC 3 :: Health, Wellbeing and Productivity. First published 2015-05-24 , updated 2019-04-17 , rebuilt 2019-04-19 . Site copyright © 2007-2019 Damon Hart-Davis. Hosted by ExNet.